Walking is probably one of the best exercises for human beings. You can walk alone or walk with friends or your children. Walking is one exercise which has benefits galore and can be done by the young and old alike, you don’t need any specialized gym equipment and there isn’t a monthly membership fee. The benefits of walking include improved muscle strength and better balance. 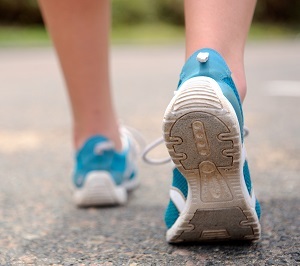 Walking will improve bone density and thus decrease your chances of developing osteoporosis. Because walking is easy, most people ignore the very real benefits and affects that walking has on the body and the mind. To get the most of your walking, start off slowly and walk every second day. Start with about twenty minutes and gradually build up to 45 minutes to an hour five times a week. One of the advantages of walking is that you can do it anywhere, from a treadmill in a gym to out in the park. Remember you are exercising, so don’t dawdle along. Walk at a brisk pace. If you can’t talk with ease, you must slow down, as you are working your heart too hard. Walking will increase the blood flow in the entire body and also regulates the heart beat. This helps to keep heart diseases at bay as the heart is functioning normally due to the daily exercise it is getting. Concentrate on your posture while you are walking and breathe through each step that you take. Walk tall, but don’t be too stiff. Hold your tummy tight and hold your head erect with your eyeline straight ahead. Your chin should be parallel to the ground. Strides should be long, but not over-stretched. Bend your arms at about 90 degrees and swing at waist level naturally with each step. If you want to walk for general health benefits, then you need to walk for at least thirty minutes a day at talking pace. For cardiovascular fitness, you will need to walk three or four days a week at a fast pace. Your breathing should be hard, but you shouldn’t be grasping for air. For weight loss, walk at least five days a week for forty five to sixty minutes at a brisk pace. You should hear yourself breathe, but you should still be able to talk. By adapting walking as a daily form of exercise you actually are getting your body used to a pattern which helps to increase the body’s metabolism. When you have a higher rate of metabolism then the weight you gain is automatically under check as your body will use up all the calories consumed instead of storing them. Walking also increases the blood flow to your brain, which helps as a stress buster. When a person is stressed out, the brain goes through dehydration and this leads to fatigue and tiredness. However walking helps in such situations by providing your brain with enough blood supply and this also helps you think clearly when you are going through stressful situations.